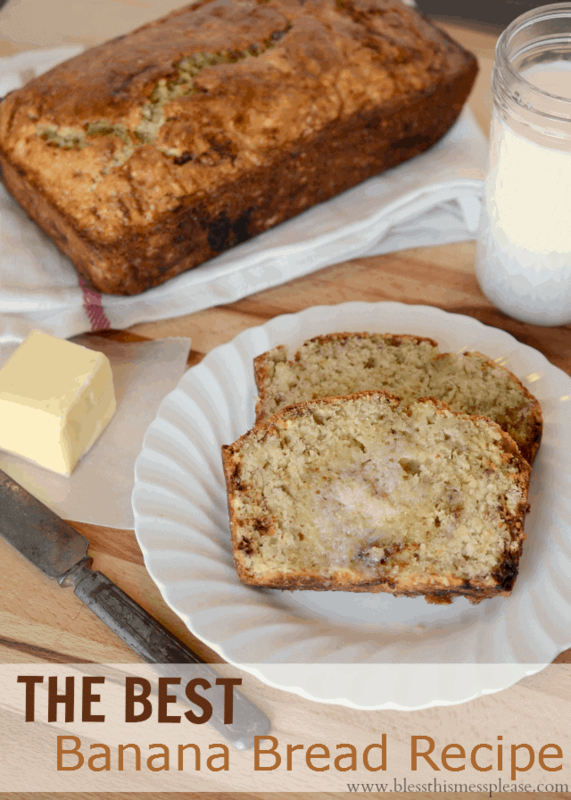 The best banana bread best recipe made with butter and a secret ingredient, Greek yogurt! Sweet, moist, and perfect every time. I wanted to get you excited for the double America’s Test Kitchen cookbook giveaway that I announced last week (in the post with that perfect pound cake). So another recipe from the America’s Test Kitchen Family Baking Book is in order. If you missed the first announcement of the giveaway, let me give you a recap. In honor of Mother’s Day ATK and I have teamed up to bring you a double cookbook giveaway. This way you can keep a copy and have a second to give away on Mother’s Day! Trust me, it’s a gift you will want to get and give! I chose banana bread as a second recipe from the book to prove a point. There are a million and one banana bread recipes, just like there are a million chocolate chip cookie recipes. Most people have a “go-to” recipe for these kind of classic kitchen favorites. And for those of us who don’t have a “go-to” we end up trying and trying recipes until we find the magical one that is everything we’ve ever looked for. Well friends, the recipes coming out of the ATK Family Baking Book are over and over again becoming my “go-to’s”, and this banana bread recipe is just that. It’s exactly what you expect from banana bread and it turns out perfect every time. Sweet, moist, delicious banana goodness… what more could we ask for?! I love that it uses melted butter in the recipe; I like butter. I’ve made this multiple times with switching out the all-purpose flour for 100% whole wheat flour and the results have been great. How do I know when the banana bread is done? Insert a toothpick in center of the loaf. If the toothpick comes out clean, the center of the loaf is done. Preheat the oven to 350 degrees. Grease an 8 1/2 by 4 1/2 inch baking pan. Whisk the flour, sugar, soda, and salt together in a large bowl. In a medium bowl combine the mashed bananas, butter, eggs, yogurt, and vanilla. Stir to combine the wet ingredients. Gently fold the banana mixture into the flour mixture until just combine. Don’t over mix. The batter should be thick and chunky. Scrape the batter into the greased pan and bake until golden brown and a toothpick comes out clean, about 55 minutes. Let the banana bread cool in the pan for 10 minutes and then remove it from the pan and let it cool on a wire rack for at least one hour before serving. FYI – I’ve made this multiple times with switching out the all-purpose flour for 100% whole wheat flour and the results have been great. Enjoy the banana bread recipe and don’t forget to enter to win not one, but two copies, of ATK’s Family Baking Book! Disclosure: America’s Test Kitchen provided me with a copy of the cookbook to send to my mom and is providing the prize to one lucky winner. I wasn’t paid to sponsor the giveaway or to gush about their product. I just love them and wanted to share that love with you! This is the best banana bread recipe! We’ve made it lots of times! So I totally agree with you! Looks yummy! I usually use one that has sour cream in it, definitely going to give this one a try. Love all the ATK recipes! I have been looking for a great banana bread recipe! 🙂 can’t wait to try it!! Sounds wonderful! Will have to try it. Can’t wait to try, it looks good. I love using yogurt in recipes, it makes things so moist. Wahoo! Thank you! I can’t wait to get baking. Thinking I’ll need to try this first. 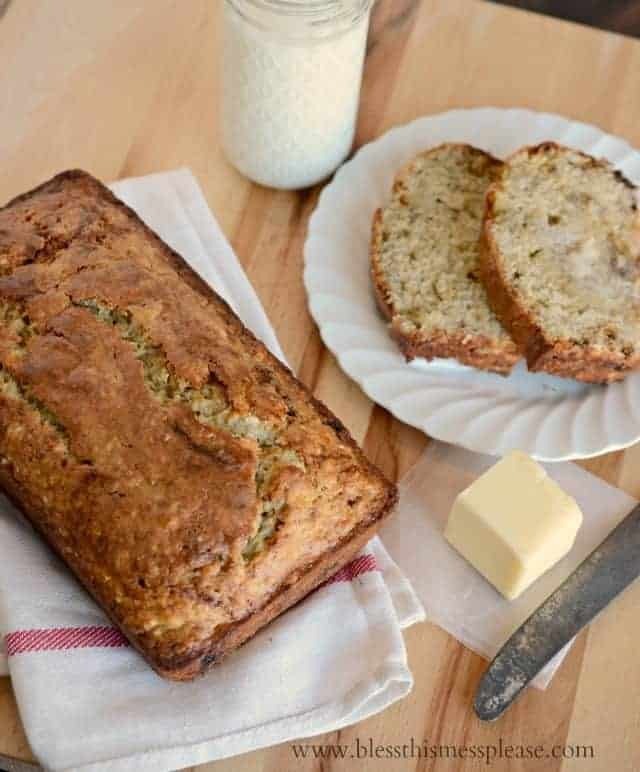 Your banana bread looks so delicious, I love the look of the texture of it – yum! you weren’t kidding, this banana bread is the best! I love that it is just a simple, no frills recipe. I couldn’t wait for it to cool before snarfing down 2 pieces, so good! I think next time I’m going to throw some nuts in! Thanks! What if I don’t have plain yogurt? Vanilla yogurt and sour cream both work instead! Thank you for posting this recipe . I love banana bread . Can this be frozen ? It can! I thaw it in the fridge overnight to eat with eggs in the morning. Quick and easy 🙂 Enjoy! Ok…I will agree….this is a great recipe! Super moist!!!! Didn’t have 3 very large ripe bananas but I had 4 very medium overly- ripe ones. It tasted just perfect. I wanted to throw in pecans as you suggested to Katie, but alas, he doesn’t like nuts in his breads. Oh…wait….he doesn’t like banana bread either….in went the nuts! I love the taste of walnuts in my banana bread….pecans stepped it up to another level! Thanks for the great recipe!!! Hi, I would like to make muffins, how long would you cook them please? Thank you. Around 25 minutes give or take, you’ll want the muffins to spring back when lightly touched and a toothpick inserted into the center to come out clean. 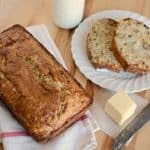 I baked your orange cranberry bread recipe and loved it so I scouted around your website to see if you have a banana bread recipe and boy is this one awesome too!! My husband loves mini muffins coz it’s so easy to pop into the mouth so I made them in a mini muffin pan. He popped 10 within 30 mins of it out of the oven!! This recipe makes about 45 mini muffins for about 13mins if anyone is interested! I know this recipe is a keeper!! Thank you so much for sharing this! !